Bright purple flowers blossoming in the Garden of Innovations at the Montreal Botanical Garden in Hochelaga Maisonneuve in Montreal, Quebec in Canada. Wandering through the Garden of Innovations at the Montreal Botanical Garden in Quebec, Canada, there is a wide variety of plants and flowers, but what catches your eye are the brightly colored blossoms. 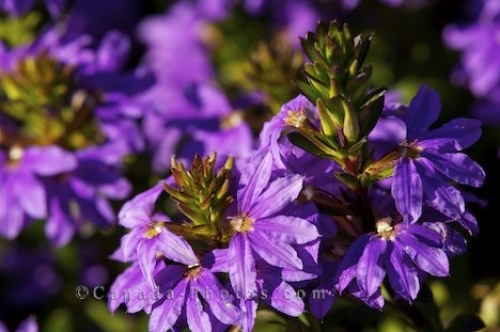 These purple flowers are radiant as their silky looking petals open up displaying their yellow centers. Purple flowers in the Garden of Innovations at the Montreal Botanical Garden, Jardin Botanique de Montreal, Hochelaga-Maisonneuve, Montreal, Quebec, Canada. Picture of purple flowers blossoming in the Garden of Innovations at the Montreal Botanical Garden in Quebec, Canada.